With summer just about here, in the Northeast anyway, I thought I’d give a little love to a technology most of us take for granted…moisture wicking and moisture wicking fabrics. The material has certainly changed the face of not only the golfing world but sports in general. It’s popularity, importance, and functionality on a global level can’t be ignored. So if you’re tired of having to change shirts during a round or have that not so fresh feeling after your round then this article is for you. This innovative fabric technology comprised of synthetic polyester micro fibers with a water-resistant coating was developed to wick away moisture from the body and speed up the evaporation process. This helps to regulate the body’s temperature when body temperature rises and keeps the shirt dry and lighter than regular cotton materials. Cotton is so 1998 and will only act like a sponge when it gets wet and weigh you down. Golf is hard enough without adding extra weight from moisture right? These wicking fabrics include advanced evaporation and thermo-regulation functionality. Essentially, as the fabric rests against the body, the fibers of the material help draw moisture away from the skin and speeds the evaporation process of the moisture. As the shirt pulls moisture away and accelerates the evaporation of said moisture, your body will in turn be cooler and hopefully drier. Recently, anti-microbial technology has been combined with the wicking properties to help eliminate and control body odor and help prolong the life of the wicking feature. Look, it’s one thing if your game stinks but do you want to stink too? Leave the stink on the course when you go to the 19th hole. Another important feature that has recently been added to this technology is UV protection where the fabric is treated with a coating of special UV blocking finish that provides extra protection for your body from the sun. Wicking fabric was believed to have been first invented by Robert Kasdan (New York, N.Y.) and Stanley Kornblum (Monmouth Junction, N.J.) They found that a synthetic knit fabric made up of micro fiber yarn had wicking properties. The patent for this technology was filed on July 31, 1998. However in 1996, Kevin Plank who later founded Under Armour, is believed to have been the first person to mass market moisture wicking fabrics while he was at the University of Maryland. So who gets credit for ‘being the first?’ No one truly knows for sure but someone is making some serious coin off this technology. Moisture wicking materials can be found in everything from hats, visors, shirts, shorts, socks, sports bras, shoes, even underwear. With all of these options to obtain this technology, there’s no excuse not to. All the major golf companies have moisture wicking materials in some way or another in use as a part of their apparel lines. Nike, adidas, Callaway, Tehama, Under Armour, PING, Cutter & Buck, and Greg Norman just to name a few. 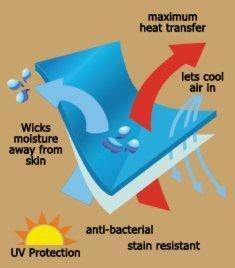 It’s recommended that when it’s time to wash your moisture wicking garment that you wash it in cool water inside out. When drying it you should hang it out to dry and avoid the dryer as the intense dry heat can rob the shirt of its wicking and cooling properties over time. Almost all of my shirts are comprised of moisture wicking materials now. 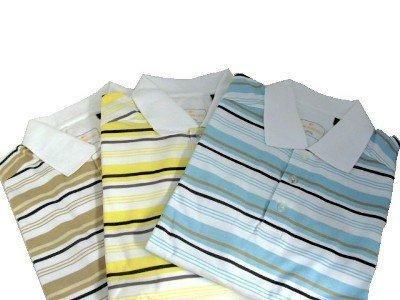 The ones that aren’t are used for when the weather is not overly hot or humid where the shirt would soak up with sweat. If you’re looking for something to make you feel better about your game no matter what the score, invest in some shirts that have this feature. Who knows, maybe one of these shirts will make you feel more comfortable and actually improve your game? as a history major i find stuff like this fascinating. thanks for the write up thanks and for the education so early this morning. most of my shirts (i wear on the course and to work almost everyday) are moisture wicking and i actually learned something valuable from reading this: turn my shirts inside out before i was them. i never knew that. thanks thanks! Awesome read. Good tips on how to care for them too. I am guilty of using the dryer! Great article! I try never to dry them in the dryer but I am guilty of not turning them inside out. I will start doing so. I’ve heard about the inside-out washing. But, not sure I put much faith in it. How is it supposed to help? I’ll let my wife know not to put these in the dryer anymore! But why should you wash them inside out? Does it matter if you have a front loader? Thanks for the care tips. I love the moisture control. No one wants to smell like a tin of porch meat. I read this again and it is packed with great info. Nice work Hanks! This is the best and most informative article that I’ve seen on moisture wicking fabric. I have some moisture wicking sleepwear from Cool Wicking PJs and it really does wick the sweat away like they claim. Our son loves the mens no sweat pajamas as well.